"GLUCK AUF!" is a traditional German salutation in the mining industry. It roughly translates as "Good Luck!" Essen, on the verge of the 20th century: immerse yourself in the fascinating world of coal mining. Extract coal from your pits, load it to wagon trains, and ship it off to gain victory points. 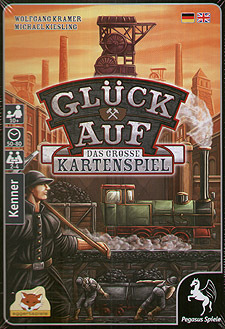 Gluck Auf - the big card game is a stand-alone descendant of the popular board game Gluck Auf (Coal Baron). With innovative ideas, and more than 200 cards, it creates a gameplay that feels very distinct, yet just as intense as that of its ancestor.